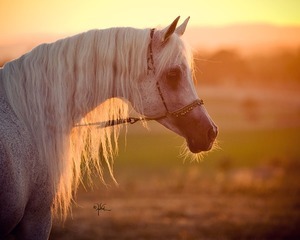 Samura is the second daughter of our foundation mare, Glorietasayonaara and sired by the handsome bay stallion, Anaza El Farid (Ruminaja Ali x Bint Deena by *Ansata Ibn Halima). Samura was foaled April 30, 1995; she was everything Henry and I hoped for, first it was a filly and a super one besides. Sam is a very spirited mare, yet sensible and kind,...she will however challenge some people! Physically, she is very pretty and although she is not an extremely tall mare, she is very well proportioned and balanced. Perhaps her strongest quality is her movement and carriage, which I see as a trait carried over from her dam. Samura and her three-quarter sister Sahbine (Ruminaja Ali x Glorietasayonaara) represent the second generation of this mare family. 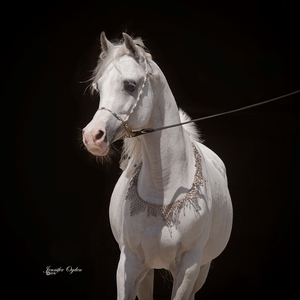 She has been a wonderful producer for us and has given us four foals sired by our stallion Ali Saroukh. We felt we wanted to try pairing the three-quarter siblings at least once, but we were so impressed with the results that we continued the combination. I was once told that it is a respected, and proven, formula among equine breeders to pair horses so that the sire of the sire is also the grandsire of the dam. Here the decision was made before ever knowing of this practice. Yet, in my opinion, the results seem to support the theory. 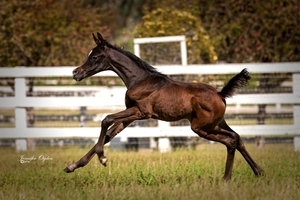 Three of the foals were colts of very nice quality, but the best foal so far is Samura and Saroukh's daughter. We named her Bint Bint Sayo, in honor of Glorietasayonaara, the dam of both this filly's sire and dam. Bint Bint Sayo is an extremely pretty grey filly that has become an amzing producer at our famr, giving us three foals so far, two fillies and a colt. Although we've been very happy with the foals Samura has produced by Ali Saroukh, we decided to try her with the straight Egyptian stallion PVA Kariim, by Imperial Imdal and out of BKA Rakiisah. On March 22, 2005 , Samura had a lovely filly. She has also been bred to Majestic Noble SMF and the result was a beautiful grey filly named Sybella SMF. Sybella SMF was the Egyptian Breeders Challenge Champion as a yearling and was sold to Mr. Mohammed Alqatani a fourth generation breeder in the Kingdom of Saudi Arabia.